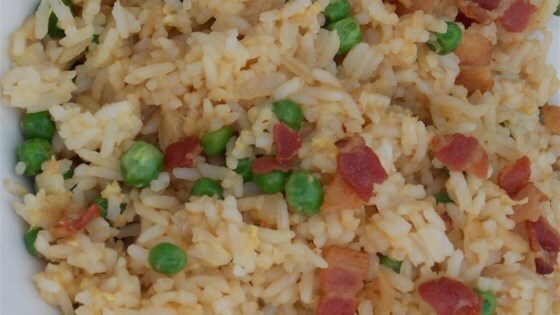 "A fried-rice twist on bacon and eggs! My dad used to make this for me on Saturday mornings when I was a kid; it's an easy and tasty brunch option. You can substitute 1 bunch broccoli for the frozen peas, if desired." Bring water and rice to a boil in a saucepan. Reduce heat to medium-low, cover, and simmer until rice is tender and liquid is absorbed, 20 to 25 minutes. Place bacon in a large skillet and cook over medium-high heat, turning occasionally, until evenly browned, about 10 minutes. Transfer bacon slices to a paper-towel lined plate to drain and crumble into bite-size pieces; reserve rendered bacon fat in skillet. Cook and stir eggs in the same skillet over medium heat until slightly set, 1 to 3 minutes. Stir yellow onion, peas, green onion, and 1 1/2 teaspoons soy sauce into eggs; cook and stir until yellow onion is translucent, about 5 minutes more. Reduce heat to low; stir rice, crumbled bacon, and remaining soy sauce into egg mixture until well-combined and heated through, 1 to 3 minutes. Easy and everyone loves it.